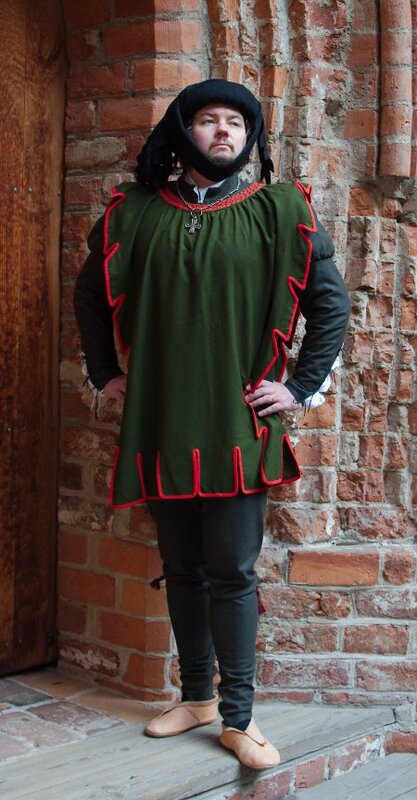 Doublet and hose are really only the base of a 15th century outfit. Doublet creates the fashionable silhouette for more elaborate overgarments. As the woollen doublet alone is impractically warm I had to abandon my initial idea of heavy fur-trimmed gown to wear with it, or at least make something more wearable on the summer season first. The lightest possible overgarment must be a tabard. It's basically just a rectangular piece of material with a neck opening. On our holiday on Vienna I had decided to avoid the temptations of fabric stores altogether, but my dear husband who knows me so well was so sweet that he insisted on taking me to one nevertheless. Among other bargains I found a piece of wool flannel which was just long enough for a short tabard. It was even already neatly cut lengthways in two. A green tabard with a darker green doublet of course needed some colorful trimming. 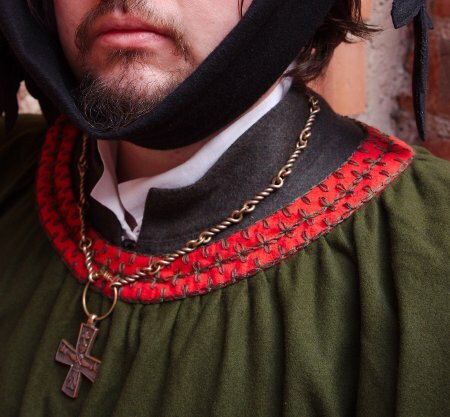 At first I thought to add a simple colorful edging, perhaps in silk, but then I realized that this would be the perfect opportunity to try out a late 14th century fashion fad, dagged edges. 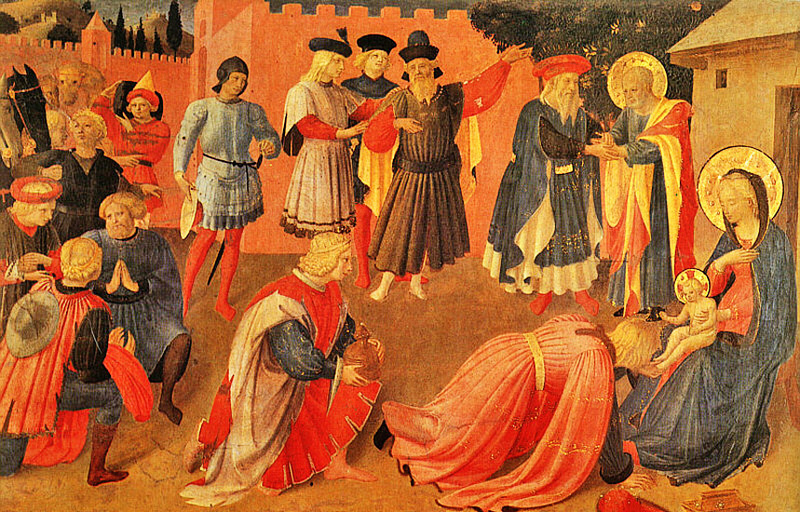 One of the inspirational paintings that gave me the idea was this, especially the kneeling man on the left. Dagging finished with binding would, of course, mean a lot more work, and I was already short of time, but the idea was too tempting to be abandoned. 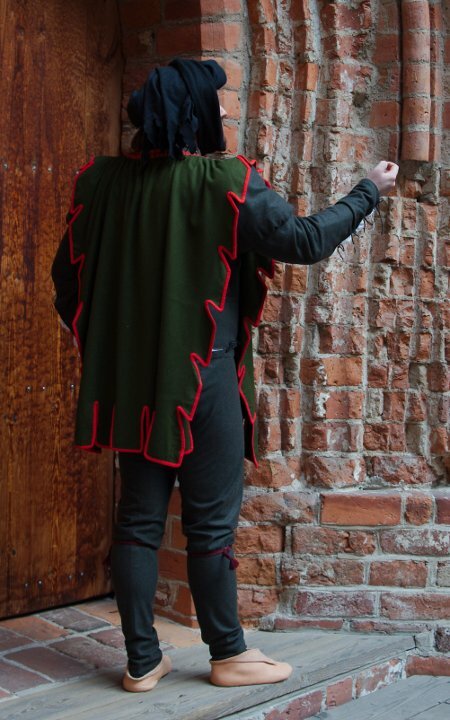 While the material for the tabard came from Vienna, the binding material was found on a little shop in a little Finnish town close to where my parents live. It was a bright red flannel, cotton but looked enough like wool. It was wonderfully soft and not too thick so it would mold neatly on the corners even if I'd cut it on straight grain. I cut the edges of the tabard piece according to the painting and began the binding. Of course I had to make it by hand, even though I was running short of time before the deadline, but then again binding all those corners neatly with machine might have been just as slow and much more frustrating. Like I had hoped, the red flannel behaved very well, and did not stiffen the edges too much. The effect of the red binding turned out very nice. On the neckline I made a 3cm wide piece of flannel, pleated the tabard neckline on it, and lined it with linen. Later I was inspired to work some embroidery on the neckline. The pattern is not based on anything save my fancy, and it's done on easy and fast lazy daisy stitch.